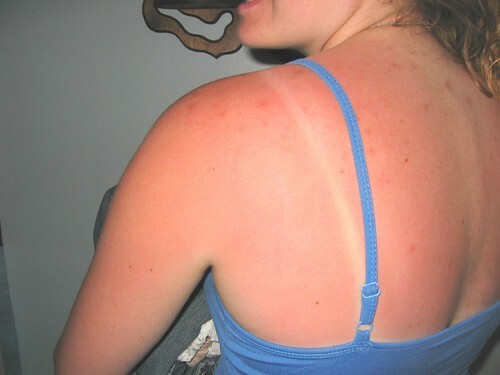 Sunburn is an uncomfortable, painful and unsightly condition. It is also one that means damage has been inflicted on the body once it appears, but there are some simple and effective ways to minimise the chance of skin damage, pink patches on the skin and, crucially, the risk of developing skin cancer later in life. Provided below are some examples. As with many things in life, prevention is much better than cure with sunburn and skin-preserving precautions should be taken, especially if out when the sun is at its strongest and brightest from midday to early evening (depending on the time of year). Aside from staying in the shade, which is arguably one of the more effective measures, the two best things to do are to cover up areas that are liable to burn with clothing or hats, and to wear sunscreen. Of these, sunscreen is probably the most important and the most misunderstood. The simple application is not enough; it needs to have a high enough SPF and it should be applied in sufficient quantities at the right intervals to have the best chance of being effective. To what extent these measures are able to limit the risk of sunburn depends on the individual’s skin type, the quality of the products in question and the strength of the sun at the time, which itself varies around the world and throughout the year. So, while knowing that sunscreen is important is a good first step, ignorance can still mean that people find themselves getting caught out and getting badly burnt. Once sunburn has occurred, to whichever degree, the key thing is to work with the body’s natural defences in helping the skin heal itself. Sunburn can present as anything from a pinkish rash or a solid block of sore, red skin to blistering skin in the worst cases. Moisturising agents such as aloe vera will work on the damaged skin, cooling and soothing it and helping to keep it supple. Natural yoghurt, particularly if refrigerated, can also be an effective soother when smeared over the sunburn-affected area. As the affected area heals, it will be tight and dry and the skin may peel off, but using gentle moisturisers regularly will help keep this to a minimum. Start as soon as possible after the sunburn has happened, but don’t apply to any blistered areas. Calamine lotion can also help relieve pain and tightness and should be applied every couple of hours to be effective. Keeping well hydrated is also important. Stick to water rather than alcohol, which dehydrates the body. Also consider sitting in a bath of cool water to hydrate from the outside if the sunburn covers an extensive area. If pain persists, ibuprofen can be used to ease swelling and discomfort. In severe cases that involve swelling and pain, hydrocortisone cream may be needed from a doctor or pharmacy. It should only be used on medical advice as it is not suitable for all types or locations of sunburn. If the sunburn does blister, ignore the urge to pop spots or scabs as this opens the sites up to the risk of infection. Post contributed by Zoe on behalf of Nuffield Health Careers. Zoe is a health blogger and freelance writer who loves to share knowledge on a variety of health topics. Good to know how to deal with the annoying sunburns. My skin is delicate and gets sun burned quickly. I think that using aloe vera is the best treatment, but If you don’t have aloe vera, cortisone cream, or another soothing topical agent for your skin available, you can make an anti-inflammatory paste out of aspirin. Simply crush up a few pills into a powder that’s as fine as you can manage, then add water a few drops at a time until it turns into a goopy paste. Apply to the affected areas. It can treat the ‘sunburn’ better.